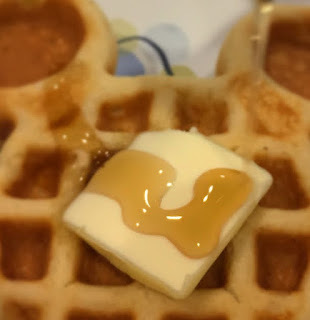 Do you enjoy pure maple syrup? Well good news...It's Tapping Season! AND just it time too because March 25th is National Waffle Day. Tapping Season, as the maple syrup season is known, is the time when the trees are “tapped” to gather sap which is then boiled in sugar houses to produce maple syrup. Did you know it takes 40 gallons of sap to produce one gallon of syrup!? Tapping season, which typically lasts about six to eight weeks, ends sometime in April. B+G Foods is the largest bottler of pure maple syrup in the United States. It's brands include Maple Grove Farms®, Spring Tree®, Cary’s® and MacDonald’s™. Pure maple syrup is just one ingredient, sourced from nature, and contains no high fructose corn syrup and no artificial flavors or colors. B+G Foods Maple Syrups are pure maple syrup is naturally gluten-free and certified kosher. Additionally, pure maple syrup offers inherent benefits of the minerals manganese and zinc. Maple syrup is a delicious alternative to cane sugar and artificial sweeteners. 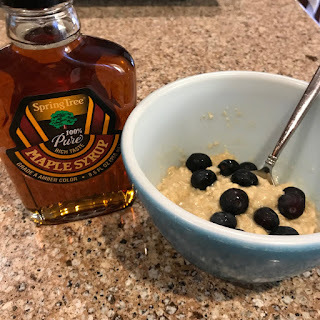 My husband likes to drizzle maple syrup on his oatmeal and fruit! Spring Tree was founded in 1976 and is named after the time of year maple syrup is produced. Spring Tree pure maple syrup is available in both Amber Rich and Dark Robust in Organic and regular options. 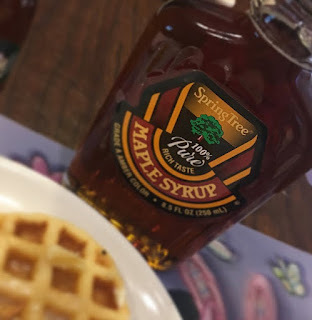 Maple Grove Farms has been making maple products since 1915 and sources syrup from local and well established farms, including trees that have been tapped since the 1700s. Maple Grove Farms offers Golden Delicate and Amber Rich grades as well as Organic varieties of pure maple syrup. Bottled in the maple syrup capital of the United States, St. Johnsbury, Vermont, in a Zero Waste Certified Facility, Maple Grove Farms pure maple syrup is nationally distributed in three sizes: 8.5 fluid oz., 12.5 fluid oz. and 32 fluid oz. Remember National Waffle Day is coming up this weekend, so grab yourself some pure maple syrup soon!